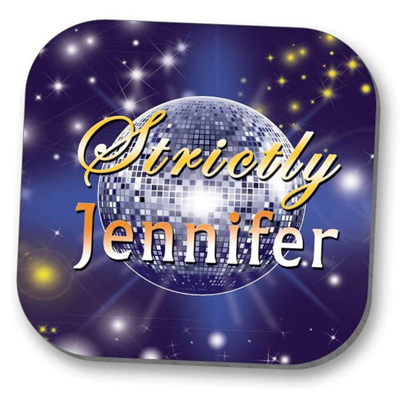 Free Strictly Come Dancing style drink mat/Coaster. It's strictly season, which means it's time to cut a rug but wait, all that excitment is thirsty work! That's why we are giving away these free personalised Strictly Come Dancing Drinks Mats/Coasters. These 10cm x 10cm hardwood coasters are the perfect accessory for any Strictly Come Dancing Fan to enjoy a nice cup of tea or even a G&T while the show is on. For your chance to get one of these all you need to do is answer a couple of questions below and tell us where to send your prize if you win one. Sorry but this competition closed on the 31st October 2018. Please ensure you enter your correct details as we will be sending the prize to the address you submitted. Name to appear on Coaster? This competition closes on the 31st October 2018 and 20 winners will be chosen at random to receive a Free Strictly Come Dancing style drink mat/Coaster within 7 days of the ending of the competition date. Prizes will be sent directly to the address we have on file and no further communication will be made.